Postcard addressed to Mr T.W. 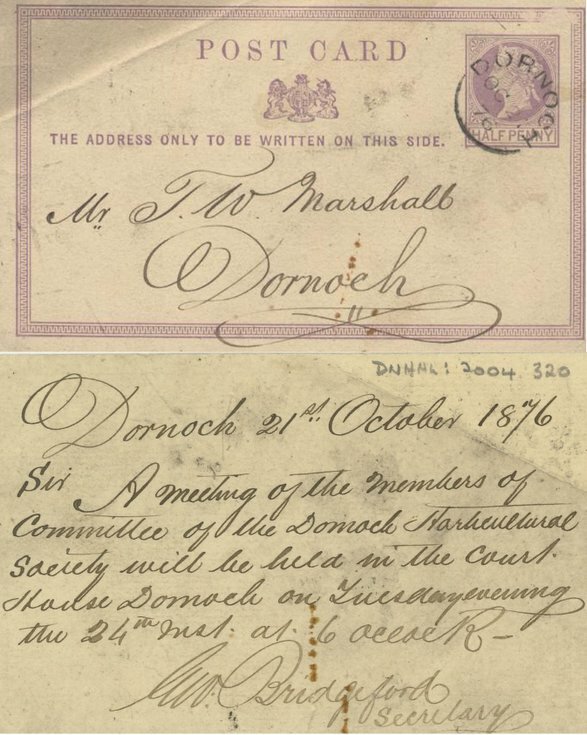 Marshall notifying him of a meeting of the horticultural society in 1876. Card is pre-stamped with 1/2p Queen Victoria stamp. This postcard was addressed to my great Grandfather, Thomas Wiseman Marshall, who lived in Dornoch with his wife Margaret (Maggie) Marhall (nee Williamson). Dornoch was also where my grandfather, Robert Williamson Marshall was born along with his older siblings Clementina Hay Marshall, Alexander Marshall, Elizabeth Marshall and young Robert. The family lived at Cuthill Farm until c1887 when they emigrated to Australia in 1888 ~ Many thanks for this fascinating family information ~ Administrator.